No more tossing and turning. Choose some of these smart products that make falling — and staying asleep — a little bit easier. There's a pretty good chance you will spend at least one night this week tossing and turning (and the entire next day chugging coffee). A recent survey from Consumer Reports found that of the more than 4,000 U.S. adults surveyed, 27 percent say they have trouble falling or staying asleep most nights, and 68 percent — or an estimated 164 million Americans — struggle with sleep at least once a week. But we aren’t just sitting idly by letting the sleepless nights add up. Americans are actively searching for secrets for how to fall asleep faster and stay asleep longer. In 2015, Americans spent an estimated $41 billion on sleep aids and remedies, and that’s expected to grow to $52 billion by 2020, Natana Raj, an analyst with BCC Research in Wellesley, Massachusetts, told Consumer Reports. 164 million Americans struggle with sleep at least once a week. While popping a pill may sound promising to us sleep-deprived, walking zombies, there is little evidence to show that sleeping pills actually add very much shut eye to your daily count, not to mention the dangerous side effects that can occur from misuse. Also available onTarget for $19, and Kohl's for $12 (normally $30). "In order to create a conducive sleep environment we want it as dark as possible and the blackout curtains will block out warming light for people who are sleeping when the sun is shining, or in the summer when it starts to get light earlier. Street lights and city lights can also interfere with sleep," says Dianne Augelli, M.D., a sleep physician at Weill Cornell Medicine in New York. "We generally want our rooms to be dark, quiet and cool. The idea is to use the blackout curtains so that your sleep isn’t disturbed prior to your wake time. So if you’re someone who is getting up at 7:30 a.m., but it’s already light at six, that extra light may cause awakening that can fragment your sleep." If you live in an urban location, or have some loud neighbors, that's even more incentive to consider a new set of curtains. The Eclipse curtains aren’t only a decorative accent in the bedroom, they block over 99 percent of intrusive light and reduce unwanted noise — making your sleep more restful. Bluetooth-only compatible version available onLowe's for $5. It’s not just the light coming from our devices, but other lights in the room, that can keep you awake. C-Sleep is a blue tooth enabled light bulb that supports your body's natural sleep cycle by emitting a calm light at night and vibrant light in the morning. You can instantly dim or brighten the bulb, without even having to get out of bed, thanks to a handy app. Plus, you can create schedules and groups to control multiple bulbs at the same time. Also available onAmazon for $123 (normally $129), Target for $124, and Overstock for $104. We've all been there: we're awoken from our sleep by the heat, and rustle around kicking off our socks and tossing the comforter to the floor. You curse your partner who insists on keeping the air off because they're always cold. What if we told you there is a sheet for that? The Temperature Regulating Sheet Set is the ultimate solution for “thermally incompatible” couples. It uses the Outlast fabric technology, which was developed for NASA to deal with temperature fluctuations in space. The "phase change" fabric absorbs and stores excess heat from your body. When you cool off, it releases the heat back to your body to maintain a consistent temperature all night long. "We definitely want you to be cool when you're sleeping. If you're too hot and you feel that the particular sheets that you have are making you too hot, then you can consider a different type of sheet," says Augelli. "Some people will swear by [temperature regulating sheets], others will notice no change. But people need a more breathable sheet. The National Sleep Foundation recommends 200-400 thread count sheets, which allow some air movement." This set from Sharper Image clocks in at 300 thread count — so if you find yourself laying awake on hot summer nights, they are worth a try. Also available on Lowe's for $150. Sense by Hello wakes you up feeling great, improves your sleep, and helps you learn how the environment of your bedroom affects your rest. “The best cure for being unable to fall asleep is utilizing a sleep tracker which is available through many apps," says Lindsey Huttner, LCSW, psychotherapist, located in Queens, NY. "In the app you will document when you get into bed, approximate the time you fall asleep, how long you sleep, how many times you woke and for how long. The app will then 'prescribe' how much sleep you should aim to get." In addition to tracking your sleep patterns, Sense has an ambient sounds feature to help ease you into asleep (and mask disruptive noise during the night), plus sensors that help you see how your environment (light, sound, temperature, humidity, air quality, etc.) 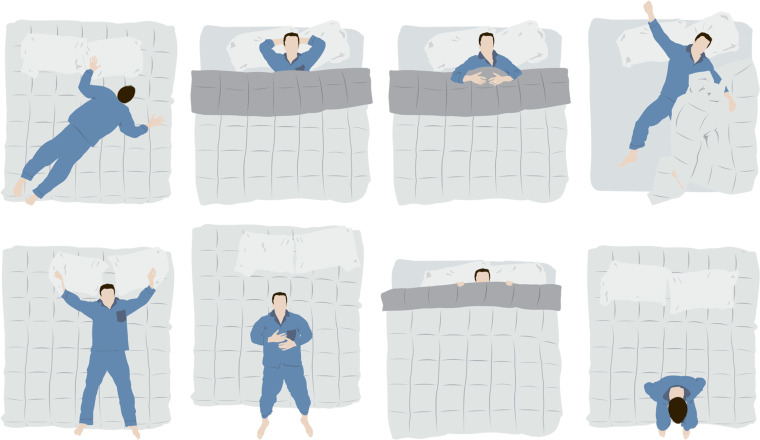 are affecting your sleep (or lack thereof). While Augelli is hesitate to recommend trackers that record sleep time (and unrest) due to a lack of evidence and accuracy, she does say that tracking your sleep patterns can be helpful for some. "They will give you some idea of your sleep, but they aren’t really able to tell the difference between [REM sleep and deep sleep] with the technology that’s available on them," she says. "It can be helpful if you’re tracking your number of hours of sleep and making sure you get adequate sleep and that you’re going to sleep around the same time. That can be a problem with a lot of people, just not sleeping enough hours. If you’re not getting your seven hours of sleep then this can help track for that." The Polar sleep system tracks a variety of different metrics, like total duration of sleep, actual sleep time and the time you fall asleep and wake up, plus it allows you to rate your sleep the next morning. Based on the data, Polar Flow will automatically provide feedback on ways to achieve better sleep. Users can then track their timing, amount and quality of sleep over time and make adjustments to their sleep schedule in order to reach their goals. Also available on Amazon for $69. Your sky-high stress levels may be to blame for all the tossing and turning, but that lumpy pillow sure isn't helping the cause. Before you run to Bed Bath and Beyond and grab a new one, consider investing in a pillow that works double duty. Sleep Envie's pillows are specially designed to help encourage better quality sleep. The Violet Pillow is infused with lavender, a scent known for its calming properties. And the Skylar Pillow has cooling technology, using a gel memory foam layer on the inside and ice yarn cover on the outside to keep all sides of your pillow cool on hot summer nights. If you just can't seem to part with your nightly Netflix ritual, “you should wear blue light blocking sunglasses while watching television,” advises Lekkos. "There are some small studies that show that the time it takes to fall asleep has been reduced for people who wore the light blocking glasses for several hours before bedtime," adds Augelli. "What you want to do ideally, is put away all your work and phone an hour before bed, in the process of your wind down routine. But if you have to work, you want to employ whatever you can to reduce the amount of impact it will have. Blue light blocking glasses reduce exposure to blue light thast suppresses melatonin, which is our natural hormone that helps with sleep; the decrease in melatonin can prevent you from falling asleep." The glasses filter out the high energy visible (HEV) blue-violet light from backlit screens, helping to ease the disruption is has on your sleep cycle. Keep a pair next to your bed, ready to grab and slip on when you get sucked into that late-night Friends marathon. Also available on Walgreens for $15. According to Dr. Michael Gelb, DDS, MS, co-author of the new book GASP! : Airway Health - The Hidden Path to Wellness, more than half of us struggle with breathing through our noses. This struggle often results in snoring. And even if you're part of the lucky half who has no problem breathing at night, there's a good chance your partner's issues are affecting your quality of sleep. Time to trade in the shaking and kicking for tossing a Mute Snoring device their way. By holding open the nasal airways like a stent, Mute helps noisy snorers and poor nasal breathers by increasing airflow in the nose. You can individually adjust the device for each nostril, so it's comfortable while you sleep. And user trials are promising: 75 percent of people reported less or much less snoring while using Mute. At one end of the spectrum of restless sleep is sleep apnea, which goes undiagnosed in tens of millions of Americans because the traditional assessment is expensive and time consuming. Which is why the developers behind Rested created the free app, made to measure and analyze your sleep. The app is a great resource for those who may be suffering from sleep apnea and not know it — and also helpful for the rest of us who are looking to track our sleep and take steps towards getting a better night's right. If you’re prone to checking email, or watching Netflix, on your laptop in bed at night, you may want to have your computer screen follow suit with reducing blue light. “You can run apps like f.lux on your laptop or computer that will automatically change the screen color as the day goes on,” says Dr. Lekkos. Like Night Shift, f.lux uses your location to synchronize your computer with the rising and setting of the sun. At night, f.lux slowly adjusts the colors on your computer screen to a warmer hue that's supposed to be less abrasive on the eyes (especially if you're in an otherwise dark room) and helps reduce your exposure to that blue light that keeps you awake. "Any platform that will reduce the amount of blue light that is emitted from your electronic devices will be helpful," says Dr. Augelli. "I definitely recommend employing them." The app was designed for those who have experienced symptoms of insomnia and are looking to improve their sleep habits. It guides users through the process of learning about sleep, developing a better sleep routine and improving sleep environments. Plus, it has a structured program that teaches strategies proven to help alleviate symptoms of insomnia. In fact, one study found that 60 percent of doctors who used the app in conjunction with treatment for insomnia found it favorable in encouraging people to adhere to instructed techniques. "For some people sound is soothing and relaxing and helps deactivate them for sleep," says Augelli. "Some of them will act to cover up other environmental noise, so in those cases it can be helpful, you just want to make sure there is no big change in frequency of that sound. (For example, on the TV when there’s a commercial that’s much louder.) We generally recommend white noise machines because they are pretty stable, but it is helpful for some people to deactivate if they hear something very soothing and that’s part of their wind down routine and they feel comfortable with that." Think a little natural background noise might help your cause? Available on your desktop, or on your iPhone, the Defonic application allows you to create your own sound experiences by combining 21 different sounds. It has a night mode, with soothing sounds like a fan, rain and white noise, so you can create your own unique sound environment to help you de-stress and prepare for sleep. While you're staring at the ceiling at 1 a.m., ever think back to those wonderful days when your mom would read you a story and you'd be out cold two pages in? Well, maybe a little bedtime story is in order. Enter: Calm, a top-rated meditation app that recently launched a new feature to the platform called "Sleep Stories," which are essentially bedtime tales for adults. You may recognize some of your storytellers: Ben Stein recorded one last fall, the platform recently released "Sleeping Beauty" read by the Bachelor's Nick Viall, and coming up is a story read by Jerome Flynn, just in time for the Game of Throne season premiere. To enable the feature on your iPhone, go to Settings, Display & Brightness, and then schedule Night Shift for the hours you will be winding down for bed (and sleeping). By doing this, you're telling your phone to move the color spectrum from cooler (blue) towards warmer (yellow) to limit your exposure to sleep-disrupting blue light at night. It will then readjust the tones in the morning when the sun rises.